Stanford University Press, 9781503603141, 192pp. 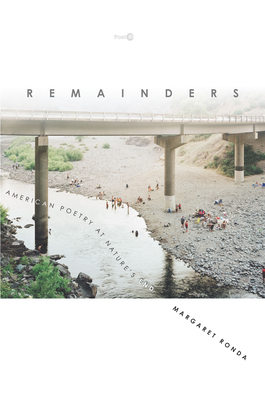 A literary history of the Great Acceleration, Remainders examines an archive of postwar American poetry that reflects on new dimensions of ecological crisis. These poems portray various forms of remainders--from obsolescent goods and waste products to atmospheric pollution and melting glaciers--that convey the ecological consequences of global economic development. While North American ecocriticism has tended to focus on narrative forms in its investigations of environmental consciousness and ethics, Margaret Ronda highlights the ways that poetry explores other dimensions of ecological relationships. The poems she considers engage in more ambivalent ways with the problem of human agency and the limits of individual perception, and they are attuned to the melancholic and damaging aspects of environmental existence in a time of generalized crisis. Her method, which emphasizes the material histories and uneven effects of capitalist development, models a unique critical approach to understanding the causes and conditions of ongoing biospheric catastrophe.